This station serves residents and visitors to the southern end of Dubai Marina and Jumeirah Lakes Towers. It is one of two stations on the Dubai Tram network connected to the Dubai Metro. Jumeirah Lakes Towers Tram Station and Jumeirah Lakes Towers Metro Station are linked by a footbridge across Sheikh Zayed Road. Hotels nearby include Bonnington Jumeirah Lakes Towers and Nuran Marina Serviced Residences. 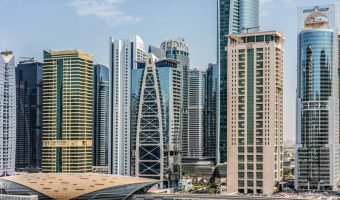 Other places in the vicinity include the Dubai Marina Yacht Club and the Almas Tower (once the tallest building in Dubai). Map showing location of Jumeirah Lakes Towers Tram Station.